Nikhil Kumar is a FIDE Master from Miami, Florida. 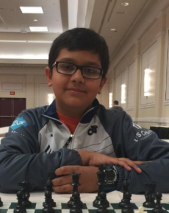 He was born in 2004 and played in his first chess tournament in November 2012. In less than four years after his first tournament, Nikhil won the 2016 U-12 World Chess Championship in Batumi, Georgia. More recently, he won the Open section of the 2016 National Chess Congress in Philadelphia. His current FIDE rating is 2479. In the U-14 age group, he is currently ranked 2nd in the US and also 2nd worldwide.